Despite concerns about the pace of the investigation into the death of Eric Garner, New York City Mayor Bill de Blasio dismissed claims that the Justice Department is dragging its feet. The mayor said he was notified by U.S. Attorney General Loretta Lynch that the case was a top priority, but it also is complicated and requires meticulously obtained evidence, CBS reports. “No one is dragging their feet and we have to make sure the resolution afterwards is fair and just,” de Blasio said. 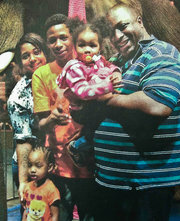 Garner died two years ago after police tried to arrest him for selling loose, untaxed cigarettes. Garner told officers he couldn’t breathe after he appeared to be placed in a chokehold by a cop. “The real issue in preventing these tragedies is working to make sure they don’t happen again in the future,” de Blasio said. Woman Rams Border Patrol Car Head-On in Attempt to Cross into U.S.